20-year old Matteo Manassero won the 2013 BMW PGA Championship at Wentworth on Sunday, defeating former champion Simon Khan and Marc Warren on the fourth playoff hole. 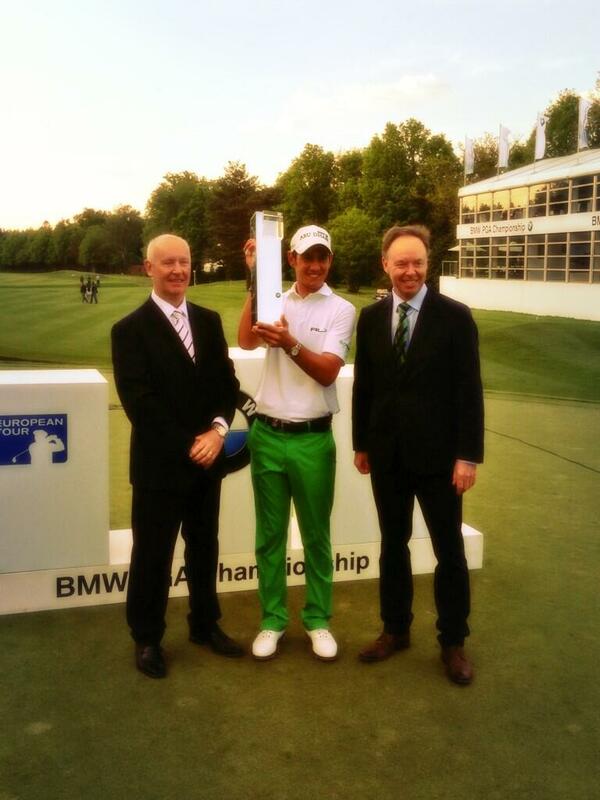 It’s the first win of the 2013 campaign for Manassero, and the fourth of his career on the European Tour. Manassero entered the day two shots back of leader Alejandro Canizares, but along with Simon Khan and Marc Warren, got out in front of the 54-hole leader as the final group approached the par-5 18th. Canizares needed an eagle on the last hole to join the three men in the playoff, but could only manage a birdie and it was down to three. All three men were previously undefeated in playoff situations, but obviously that was going to change here. Warren put himself out of it right on the first playoff hole, spraying his drive into the right trees. Khan and Manassero played even up for the next two playoff holes before Khan’s approach on the fourth playoff hole found the water, opening the door for Manassero to two-putt for the victory. If he wasn’t thought of as the best young player in the world already, winning a huge tournament like this should seal that for Manassero. Think about it for a second: at 20 years old, Manassero already has four European Tour wins, with victories in Spain, Malaysia, Singapore and England. On the CBS broadcast of the PGA Tour stop at Colonial this week, David Feherty mentioned that 19-year old Jordan Spieth is likely the best young player in the world, but that’s definitely not the case. He was ranked 57th in the world coming into this week, and he’s going to see a huge jump now into the 30’s after this win. The next step for Manassero is to start contending in major championships, which is crazy to think about when you consider his age, but you could argue that this tournament is the biggest non-major on the golf calendar, so people are going to start expecting better results in the four majors. He’ll have that chance now as well, as the win got him into the U.S. Open, the Open Championship for the next three years, and made him exempt on the European Tour for the next five, when he’ll be the ripe old age of 25. If he wants another target, the win puts him just one shy of Constantino Rocca for the most ever by an Italian born player on the European Tour. He’s not the longest hitter in the world, but his accuracy and putting are phenomenal, much like the style of game played by former world number one Luke Donald. The best thing I heard about him this week was mentioned on the Sunday broadcast, when it was said that in every tournament he plays in, he goes out with one of the early groups and walks the course with them to try and get a feel for how the course is playing and what’s going on. I don’t think he’s going to want to do that in a few years, but it shows a willingness to know everything about what’s going on every day, which to me at least, shows a maturity well beyond his years. Seeing as how this is the flagship event for the European Tour, it draws not only a big crowd, but also a world-class field which is usually better than the PGA Tour’s event at Colonial in the same week. That was the case again this year, but unfortunately for both the fans and the event itself, four of the biggest name players in the event ended up missing the cut when Rory McIlroy, Ian Poulter, Graeme McDowell and Luke Donald all failed to make the weekend. Obviously you expect all four of these guys to make cuts, but it shouldn’t come as much of a shock for McIlroy, Poulter and McDowell based on their prior records. Between the three of them, they’ve played 26 tournaments at Wentworth and have only one top-5 finish, which was McIlroy’s back in 2009. There’s also 13 missed cuts and all three of them have scoring averages over 72, but Donald not making the weekend should be a big shock. Not only was he the two-time defending champion, he also has five other top-10 finishes at Wentworth in his career. Great finish for Miguel Angel Jimenez, who is just getting back from off-season knee surgery. The 49-year old needed the surgery after suffering an injury while skiing, and made this his second event back after playing in the Open de Espana in late April. This week’s appearance also gave Jimenez 600 career appearances on the European Tour. Most people expected Alejandro Canizares to fold under the pressure of playing with Lee Westwood in the final group, and while that happened a little bit with Canizares finishing one shot out of the playoff, Westwood ended up three shots out of the extra holes. Sergio Garcia picked up his 18th consecutive top-25 finish this week, and was very well received by the Wentworth crowd despite his nonsense with Tiger Woods over the past few weeks. Of course, that likely won’t be the case at Merion in a couple of weeks, but Garcia can’t worry about that just yet.